Dice Devils GC: A Newb with Zee Germans! I'm very excited about my first post on TableTop Tacticians. Having just recently moved back to the Ottawa area I joined up with the locals in their FoW mid-war tournament at Skirmish last weekend. 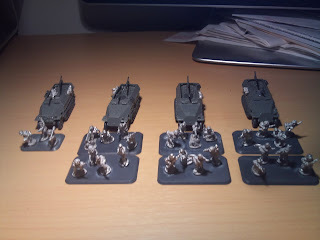 With the Skirmish tournament and the Mid-War Escalation League tucked away the boys planned on starting a Late War Escalation League which is the perfect opportunity for me to start my Germans. Ever since I was 5 years old I remember playing wargames with my Dad. He'd play allied, I'd play the Germans. I liked the Germans because all of their vehicles looked cool. Tanks in micro armour scale were awesome to look at, half tracks were sleek and angular. Good toys to play with. Fast forward 29 years and I find myself once again looking at half tracks with a kind of quiet wonder. Panzergrenadierkompanie mechanized list from the Fortress Europe book. I love the look of the list because it's a primarily mech-infantry list that looks quick, on paper, and sports a kind of finesse approach to tabletop strategy. 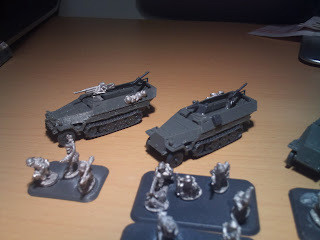 For our first escalation, I think that we're settled on 600 points so I'm putting together my 2 Gepanzerte Panzergrenadier Platoons and the Command Section. LOTS of halftracks and a ton of infantry to dig in. I've opted for some anti-tank support to get rid of those annoying armoured companies that I might come across. So far I believe my list is going to consist of a Company HQ Platoon with the optional Panzerschreck Team, a full GPZ Platoon (seen above) with a Panzerknacker upgrade and a smaller 4 stand MG GPZ Platoon with the Panzerknacker upgrade. It'll be 600 points on the nose, no less than 10 half tracks and 15 infantry stands. That should be a decent amount of dakka! Welcome aboard! Looking forward to your contributions mate - Cheers!